Update: Rainy weather conditions have forced organizers to postpone the event. Per Milton Street, the sound guy wouldn't set equipment up in the rain. The rescheduled event will take place "probably next week," he said. Less than two weeks after airing his grievances with the UberPOOL system, Milton Street will urge fellow drivers to become associate members of a union that already represents the the ridesharing service’s local limousine drivers. A rally is set for 10:45 a.m. Tuesday outside Uber’s “Greenlight Hub” help center on Bartram Avenue in Southwest Philadelphia. 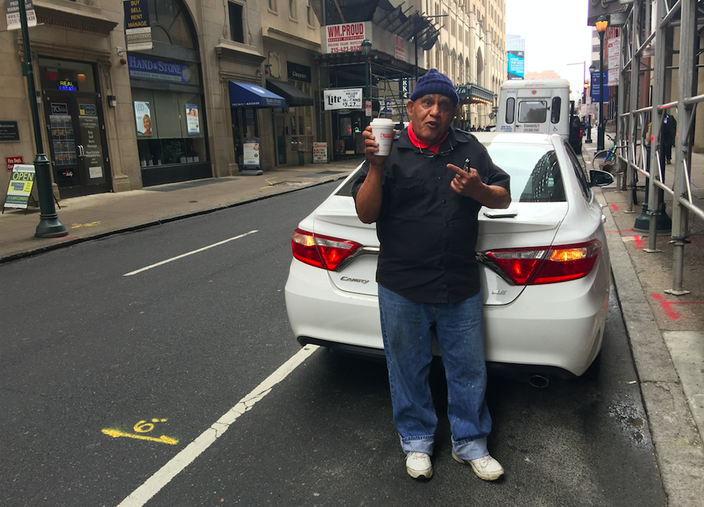 After a February 23 PhillyVoice story chronicling Street’s gripes with an UberPOOL system that offered “slave wages,” a representative from the Newspaper Guild of Greater Philadelphia, Local 10 of the Communications Workers of America reached out to Street to gauge his interest in teaming up. Street said he spoke with Bill Ross – executive director of a guild that represents some employees at the Inquirer, Daily News and philly.com – and learned that UberBlack and Uber limousine drivers (through the Philadelphia Limousine Association) had made moves to become associate members. At Tuesday’s rally, Street will urge UberX drivers – estimated at 12,000 in the Philadelphia market, though they will assuredly all not be on hand – to do the same, while using a sound system to rally support behind other complaints. “We're going to ask them for an option on UberPOOL. If drivers want to accept it, fine; if not, no penalty," Street said after the meeting with Ross and a representative from the UberBLACK drivers' association. He also noted that the associate guild membership could help drivers with, among other benefits, health care. A spokesman for Uber said Monday afternoon that surcharges are actually added to Philadelphia-to-NJ (and vice versa) trips, but that the company needs to do a "better job of communicating that to drivers." As it comes to tips, the spokesman added there is a note on the help page of Uber's website that tells passengers they're not obligated to offer gratuities, but they are accepted. Regarding the unionization effort, the company had no comment at this early stage but left the door open for weighing in later should it progress. Street noted that he’s calling the group the “UberX Drivers Resistance Association” and it intends to take its complaints to the public and other unions as well for support. Milton Street, a former state senator and Philadelphia mayoral candidate, plans to organize fellow Uber drivers to fight back against the UberPool fares that he argues doesn't properly compensate them for their services. The event was delayed a week as the effort came into focus. After their Monday morning meeting, Ross noted that the limousine drivers came into the union's fold just last week. It was then that he realized some UberX drivers had already joined, as they also drive for UberBLACK. "To my joy, (the limousine drivers who'd spoken to numerous unions) decided to affiliate with us," he said. "Milton wants to get that word out, which is what he's doing tomorrow. "The first thing (about joining is that it would) give drivers a voice. We'd build a bridge to Uber not just through texting on the app, but we'd like to get them to sit down and address the issues as the employees' representatives.," Ross said. "They don't have a collective bargaining agreement, but we can represent them and get issues on the table and, hopefully, Uber and the Philadelphia Parking Authority, will address them."